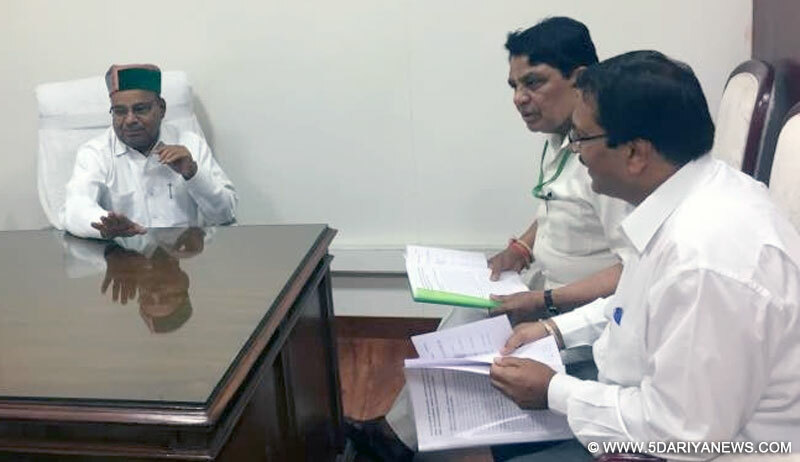 Social Justice & Empowerment Minister Dr. (Col) .Dhani Ram Shandil today met the Union Minister for Social Justice & Empowerment Thaawar Chand Gehlot at New Delhi and discussed about various issues pertaining to State which were pending at the level of Govt. of India.He requested the Union Minister to release a total amount of Rs.195.40 crore which was pending to be disbursed under Post Matric Scholarships SC, and OBC, Dr.Ambedkar Post Matric Scholarship for Economically Backward Classes (EBC) (CSS). He said that under the Pre Matric Minority Scholarship Scheme, National Scholarship portal has disbursed Rs.25.41 Lakh to 1524 beneficiaries whereas 1039 persons were left out yet due to lack of funds under the scheme.the Minister said that the proposal under Pre Matric Unclean Occupation Scholarship Scheme for the year 2016-17 was still under process at the level of Govt.of India and no sanction has been received for payment yet. He further said that under Pre Matric Disability Scholarship Scheme, National scholarship Portal has disbursed an amount of Rs.3.83 lac to 56 beneficiaries and requested for releasing the amount to be disbursed to 18 left out beneficiaries.Dr. Shandil also requested the Minister to sanction all the proposals recommended by state level Multi Disciplinary Grant in Aid Committee under various Centrally Sponsored Schemes under prevention of Alcoholism and Substance (Drug) Abuses and Assistance to Disabled Persons (ADIP) for purchase/fitting of Aids/appliances, Integrated programme for Older persons (IPOP) and Deendayal Disabled Rehabilitation Schemes (DDRS) sent to the Govt.of India. He apprised the Union Minister about the progress under various schemes being implemented by the State Government.Sandeep Bhatnagar, Director Social Justice and Empowerment was also present.